In the ever-growing discography of master musician Joe McPhee, his solo albums have stood out as supreme ur-texts of his consummate improvising and compositional skills. Joining the ranks of such landmark records asTenor, Graphics, and As Serious As Your Life, Everything Happens For A Reason is an unadorned showcase of this influential pioneer in the world of creative improvised music. 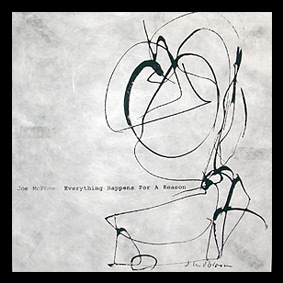 Recorded live in Austria in November of 2003,Everything Happens For A Reason features McPhee on pocket trumpet, soprano and alto saxophones. A limited edition of 482 copies on 180 gram vinyl, with a Judith Lindbloom silkscreen print on rice paper and liner notes by McPhee.